Dodatkowe informacje Extremly fast acting felling head with feed rolls and delimbing kit! Accumulating allowing multiple stems before putting down material. Cuts with a knife blade to minimize maintenance, meaning no broken chains or swords. 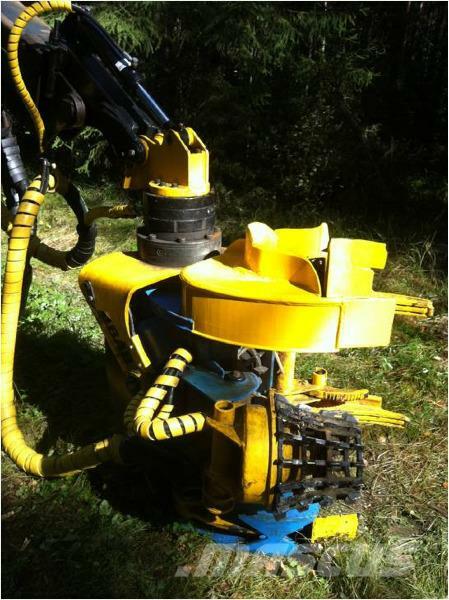 Crane tilt function for controling the felling head. Automatic control system makes it very quick and easy to operate. Aggresiv feed rolls opening the bark for fast drying of biomass. Cuts up to diameter 280 mm of soft wood. Complete incl rotator, electrical controlsystem, adopting arm with cranetilt. Easy to mount to the harvester by clamping the adopting arm around the stick of the crane.